Anyone expecting a cakewalk and a cricket score was left disappointed at Planet Ice last night (March 27) as Peterborough Phantoms had to earn their English Premier League play-off finals spot the hard way. It would have taken a major collapse from the city side to fail to book their berth in Coventry, but such events are not beyond the realms of possibility at this do-or-die stage of the season. The defending champions hit their own ice in possession of a 4-1 aggregate advantage after a successful visit to South Yorkshire for the first leg 24 hours earlier. But Sheffield were never going to go down without a fight although that arrived in the form of a terrific performance rather than the thuggery that has been commonplace in their make-up for far too long. Well, up until the last few minutes anyway when their frustration finally got the better of them with the scoreline level on the night at 5-5 and Phantoms easing through with a 9-6 aggregate triumph. Phantoms’ display in the second leg certainly couldn’t be categorised under ‘convincing’ though as they failed to beat Sheffield for the first time in eight meetings this term. Slava Koulikov’s men - playing an import down for the second night running with Darius Pliskauskas away for family reasons - threw away a two-goal lead to fall behind before snatching a draw as Steeldogs imploded around them. They did, in their defence, always have a cushion on aggregate, but that won’t have stopped more than a few sets of nails being nibbled on with the two teams certainly not looking five places and 25 points apart. The excellence of opposing netminders Janis Auzins and Dalibor Sedlar ensured a high-speed opening period ended blank, but it appeared to be only a matter of time before the breakthrough was made. And a powerplay from puck-drop in the second session provided the perfect opportunity for Phantoms to hit the front with two goals in the space of 49 seconds. Ales Padelek blasted in the opener during a spell of five-on-three before the Steeldogs gained a man back only to see their arrears double courtesy of Marc Levers. Stan Lascek smartly halved that lead to trigger a frantic spell of five goals in little more than seven edge-of-the-seat minutes. Milan Baranyk was next to light the lamp for Phantoms with Cole Shudra squeezing in a reply for Sheffield. Then Martins Susters swept in a stylish strike before Lubomir Korhon rifled one into the roof of the net for the visitors. 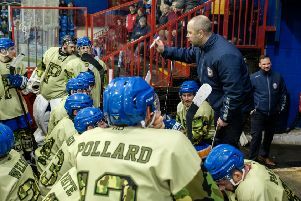 That seven-goal session was followed up by plenty more excitement in the final stanza as Sheffield turned their narrow deficit into an advantage on the night before being masters of their own downfall. Andy Hirst made some Steeldogs pressure count on a powerplay to level and then darted in to fire them ahead and slash his side’s aggregate arrears to an uncomfortable two goals. Phantoms were having the odd wobble on the ropes by then, but they received a gift-wrapped ‘get out of jail’ card signed, sealed and delivered by a couple of moments of Steeldogs lunacy. Craig Elliott delivered a needless trip on Auzins to earn himself a penalty which was swiftly followed by a misconduct call on his player-coach Greg Wood for having too much to say. And import Lascek quickly lost the plot with a succession of cheap and late checks to earn his marching orders and join his boss back in the locker room. The five-on-three passage that followed provided Phantoms with an opportunity to level on the night courtesy of Baranyk before Sheffield resorted to sending out enforcer Calum Pattison to jump Greg Pick and earn a match penalty. But that won’t have concerned Phantoms. Their sights are already set on the Skydome in Coventry and providing a silver lining to a second successive season.